“His master replied, ‘Well done, good and faithful servant! You have been faithful with a few things; I will put you in charge of many things’” (Matthew 5:21 NIV). I never had a big ol’ dream to be a speaker and a writer, but that’s what God had planned for me. I just put one obedient foot in front of the other and that is where the path led. We don’t obey God in the seemingly small assignments in order to get the bigger ones. However, God will never entrust someone with a big assignment who has not proved herself trustworthy in the small. When God invites you to join Him in His work, what you do next reveals what you truly believe. If you trust Him completely and follow His lead in the great dance of obedience, then you will experience the spins, twirls, and lifts of the glory life Jesus came to give. If you decide to sit this one out because of fear, then the chairs along the wall are positioned just for you to sit and watch the less fearful wow the crowd. But know this: The band is playing your song. When God extends His invitation to join Him in the divine dance of obedience, the time to accept is at that very moment. We have about 10 to 30 seconds before common sense talks us out of obeying God’s promptings. The time to act is as soon as you sense the Spirit calling you to move. As you live and move and have your being in Him, the places He will lead you will become more and more glorious as you learn to relinquish control and trust Him. Big assignments begin with a thousand tiny “yeses.” Small steps of obedience become beautiful sweeping moves of faith. But first…you have to take the little steps. Read 1 Samuel 16 and note when David was anointed as king. What did David do between 1 Samuel 17 and 2 Samuel 2? Just scan the headings. Do you find yourself longing to hear God’s voice—not as a once-in-a-lifetime experience but on a daily basis? Do you have a desire to see His fingerprints on the pages of your busy life? It is not a matter of does He speak, but will we listen. 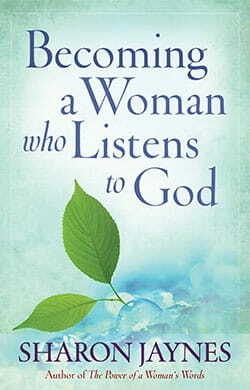 More than a “how to” book, Becoming a Woman Who Listens to God is a warm, fun, tender look at recognizing some of the wonderful and unexpected ways God reaches out to us with His love and presence. You will feel refreshed, reaffirmed, and renewed as you engage in listening to the One who loves to talk to you.